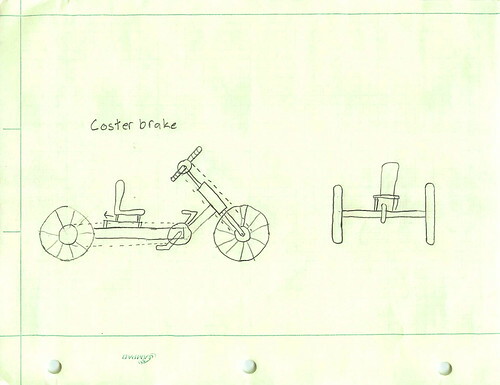 Our project is going to be designing a hand powered tricycle for a 5 year old girl with multiple medical problems. She has Pierre Robin Syndrome and scoliosis. This tricycle will assist her by supporting her better than a bike could due to her curved spine and to inspire her to learn to pedal a normal bike in the future. 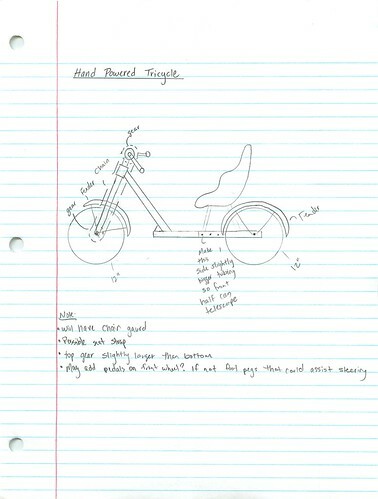 For spring 2012, our team has chosen to design and build a hand powered tricycle for a five year old girl. We met with the family on Janurary 28 to get some specific information for the design. The girl has scoliosis but she has strong mobility in her arms and legs. However, she can't grasp the concept of pedaling with her feet. The parents informed us that they would like for the tricycle to be hand powered but designed to teach her to pedal with her feet. They also said they want it to be adjustable to her height and weight as she grows. Additional specifications include safety, comfort, steering, appearance, and cost. This design moves the pedals up on the steering shaft to make them double as a propultion system and a steering device. The seat will be a go-kart seat for support and stability so the child will not fall off the tricylce. The design will also include a chain gaurd (not shown) as a safety device so the child will not get injured by the chain. The tires will be 12" flatless tires so a flat tire will not be an issue. It will have a powder coat finish which will last longer than regular paint. The gear ratio will be a 3:1 or 2:1 to make it easier on the child. The front half of the frame will slide into the rear part for adjustment as the child gets older. This design incorporates the idea of an elliptical machine. It will have a bucket seat with side supports and a safety harness. There will be foot supports on the bottom bar which will teach the girl the concept of pedaling. It will have a 16" front wheel, and 2 12" wheels on the back. It will have a notched frame for height adjustments, and a chain and gear system with a 3:1 gear ratio to reduce the force needed to power the tricycle. This design uses both a hand-powered and foot-powered to allow the child to learn to pedal with her feet. The seat will be a bucket seat to provide comfort and support. The front tires will be 16" and the two rear tires will be 12" each. The gears will be a 3:1 to allow the child to peddle easier. The seat will be attached to a slider mechanism to allow the child to use the tricycle as the child gets older. The brakes will be a coaster-brake style. 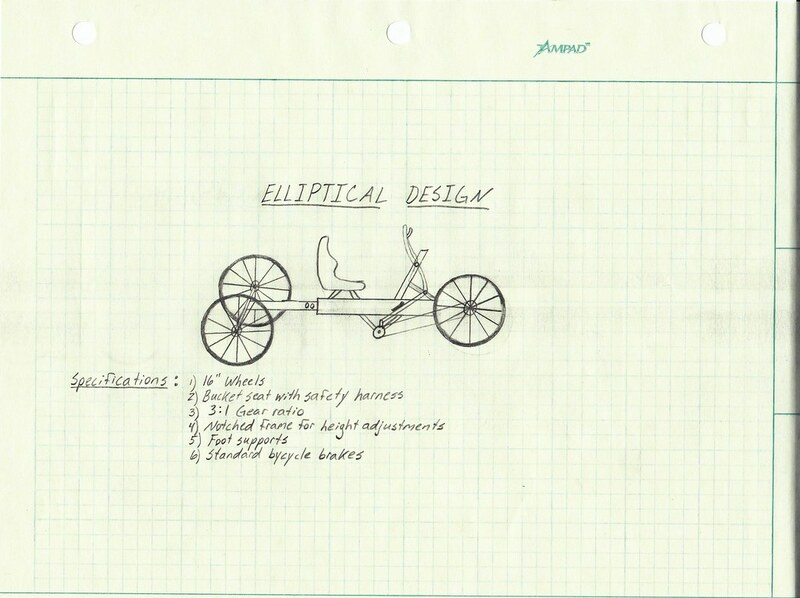 Three analyses were performed on the design of the tricycle. A stress analysis was done on the frame of the tricycle assuming a 100lbf load. An analysis of the different gear ratio possibilities was done to help narrow down the best ratio for the abilities of the girl. Lastly, a turning radius analysis was executed to help give an idea of the amount of space the girl will need to turn around the tricycle. An analysis done on the amount of deformation of the frame when a 100 lbf load is applied using Inventor. 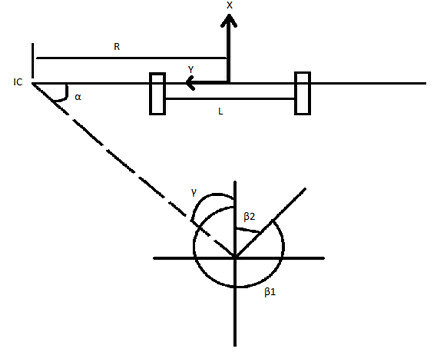 An analysis done on the maximum principal stresses on the frame when a 100 lbf load is applied using Inventor. We chose to go with a turning radius of 42" which would be at an angle of 23.198 degrees.